Along the waterfront of Cape Charles in Southern Labrador, Canada you will find some old and new fishing stages and houses. 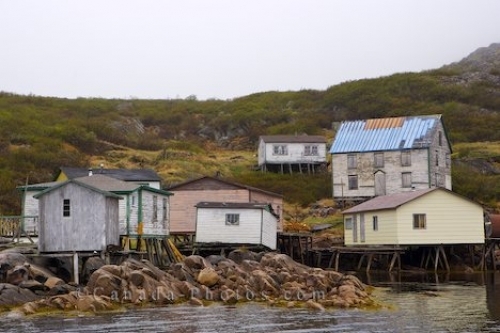 The remote community of Cape Charles in Southern Labrador, Canada is a small fishing village along the coastline with a total population of about ninety. Old fishing stages along the water's edge and houses that sit atop the green hillside are what makes up this unique village with no other signs of other Southern Labrador towns for about forty kilometers. Houses and fishing stages along the waterfront of Cape Charles in the St Charles Harbour, Viking Trail, Trails to the Vikings, Southern Labrador, Labrador, Atlantic Ocean, Atlantic Canada, Canada. Picture of fishing stages and resident homes along the coastline in Cape Charles in Southern Labrador, Canada.